Apple’s iron hand on the App Store vs. Open Source. 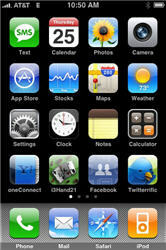 For the longest time, my iPhone was jailbroken, but when the 2.0 upgrade came along, I went back on the grid. And while there are tons of great apps in the App store, there are a few that were in the gray market that just don’t seem to be replicated in the App Store. For example, there was a handy utility called “Services,” which brought up a single interface to turn on and off my Wi-Fi, Edge Network & Bluetooth. It was so much more efficient than hunting through the “Settings” app. Given the battery problems and the wi-fi nag, I used it every day. Also, I kind of miss being able to customize my Springboard and icons. Yes, I can move the icons around, which is nice, but that’s it. I can’t change them, or change the look of the springboard or anything else that might allow me to fully and completely personalize my iPhone. Of course, I could easily jailbreak, but currently, I’m a bit burnt out on doing all of the cat-and-mouse involved with jailbreaking, upgrading to the latest firmware, and then re-jailbreaking. Which is what attracts me — initially — to the Android platform. It’s open source, and no one has a vested interesting keeping people lashed to — for example — their music store. Let’s face it: if people are able to develop useful, above-board 3rd party apps for the Android platform from the get-go — free of what seems like an arbitrary system of approval — then phones based upon that platform are eventually going to be more useful than the iPhone. Apple has kicked open the door, showing us the future of personal communication devices, the question remains whether or not they’re going to fully enjoy the party. The general chaos surrounding the rollout of the 3G. Of course, the question remains as to exactly what is going on at Apple in the first place. Only the blindest of blind brand groupies could miss that the rollout of the 3G, App Store and .me service were less than optimal. In fact, had it been better managed, I wouldn’t be writing this piece. I’d be enjoying my 3G. But I couldn’t get a 3G when I was all fired up to get one. I mean, I could have waited overnight or even for hours in line, but why? We’re not talking about Zeppelin concert tix, but rather a device that will be available in roughly the same form for quite some time. And so on. I realize that some of these have been addressed with the 2.1 release, but that’s not the point. And the 3G signal problems continue to persist. AT&T has flat-out said that they weren’t ready. All in all, I’ve decided that these issues are worrisome enough that it’s not worth spending another couple hundred dollars to upgrade a phone that cost me $500 in the first place and was still working great just to get a phone that worked slightly more great. Or worse, slightly less great. Better to wait, and see what happens. With both the iPhone and the G1. And when my indentured servitude to AT&T is done next summer, I’ll be in a position to do whatever I choose, based upon any number of factors, but mostly price, UI and applications. And if I determine that the latest version of something running Android has the featureset I want, it’s bye bye iPhone. Which would be a shame. Not just because the iPhone probably the most revolutionary device that Apple has ever created — and I really do love it — but also because it would mean that they somehow squandered its promise.